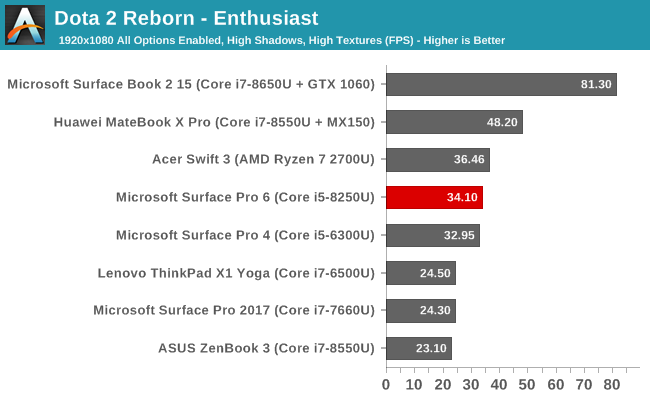 While many will lament the loss of the Intel Iris graphics on this year’s lineup of Surface Pro computers, as already stated, there’s no Iris graphics available anymore in the 15-Watt lineup. There’s no doubt that the extra execution units, and the extra eDRAM as a system cache were valuable, but you can’t sell a product that doesn’t exist. 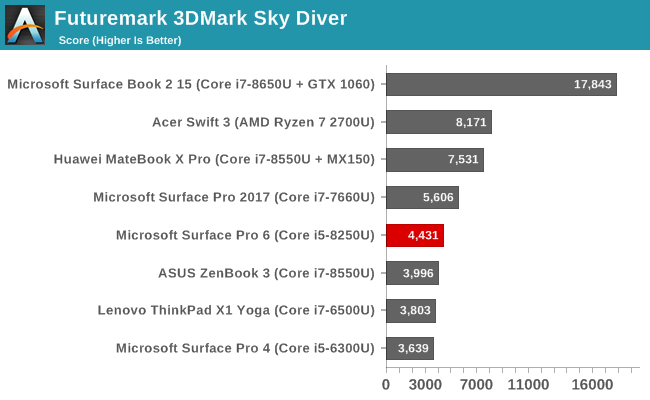 As such both the Core i5 and i7 models have the Intel UHD 620 GPU for 2018. 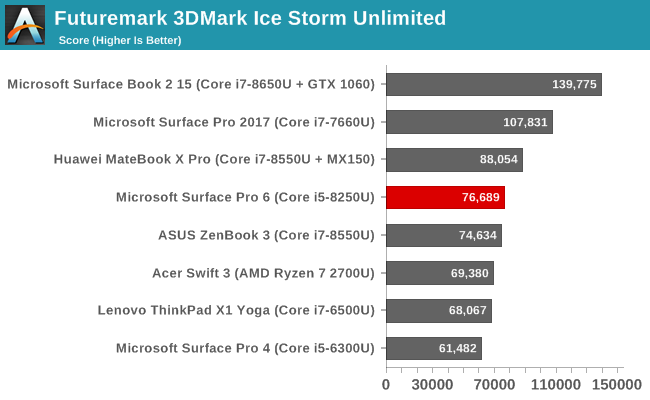 Whether or not this will make a dramatic impact on real-world use will depend heavily on what the GPU was used for, since in some cases the wider GPU could made a noticeable impact, but often it was highly thermally limited in a 15-Watt package anyway. 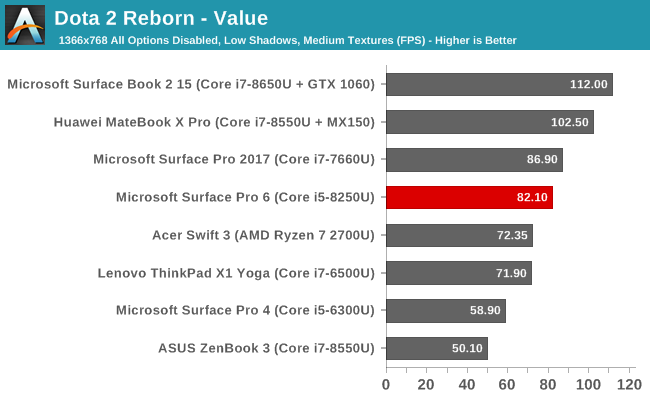 To test GPU performance, the Surface Pro 6 was run through our non-gaming GPU suite. 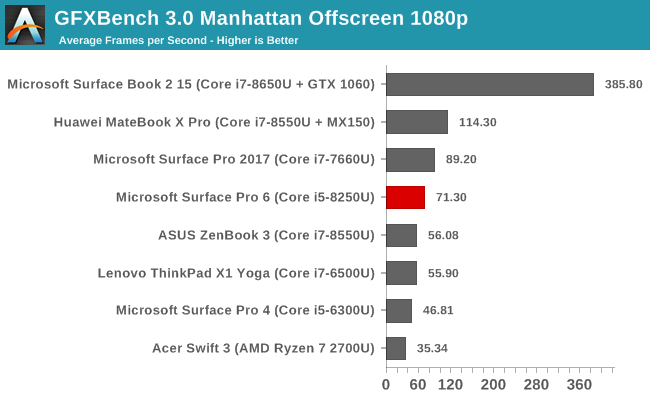 If you’d like to compare it to any other device we’ve tested, please use our online Laptop Bench. 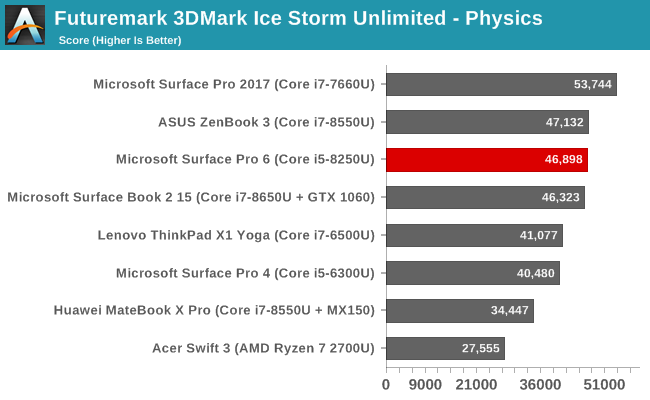 In the synthetic 3DMark from UL Benchmarks, the Surface Pro 6’s extra CPU grunt helps it stay with the Iris equipped 2017 Surface Pro except in the least demanding tests, although on the most demanding GPU test, which is Fire Strike, the UHD 620 is well behind AMD’s Ryzen 7 in the same 15-Watt package. 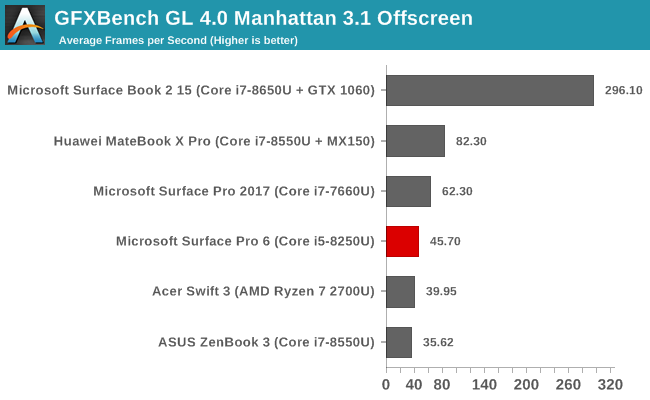 GFXBench is an OpenGL based test and is less relevant due to the lack of new OpenGL titles. These tests are aimed at the mobile computing crowd for smartphones and tablets, although in those cases the tests are run in 16-bit mode and not necessarily in OpenGL either so the results aren’t directly comparable. 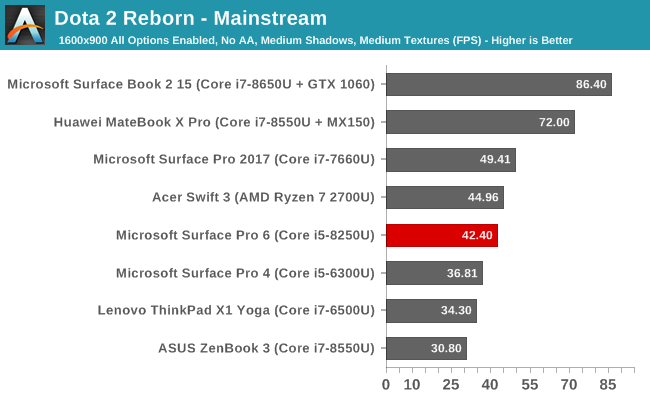 Here again we see the Surface Pro 6 in the middle of the pack, although the AMD based system drops off due to OpenGL drivers. Valve’s Dota 2 is a very popular arena battle game, and the game itself is playable on a wide-range of devices. 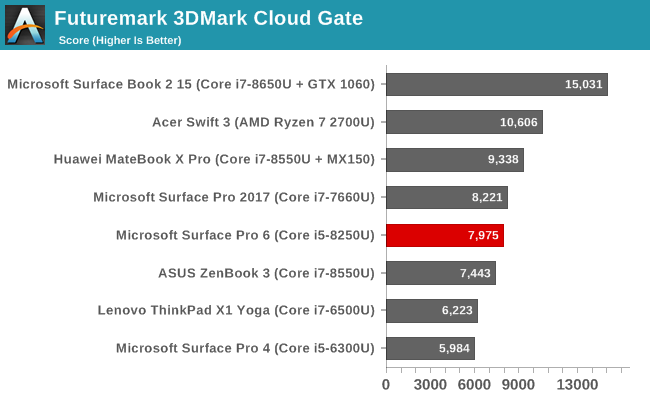 The game engine tends to be CPU bound quite quickly, but is still a good yardstick when looking at lower-power GPUs. Here the Surface Pro 6 does quite well, especially on the lower detail settings. 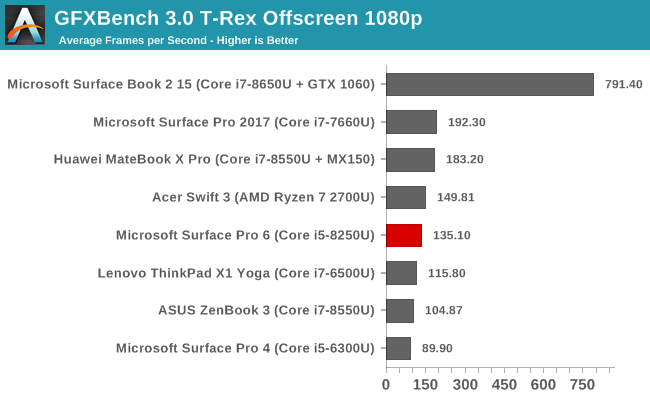 When the game is set to its maximum settings at 1920x1080, the Iris GPU in last year’s Surface Pro ends up throttling heavily and offering lower performance despite being a quicker GPU on paper. 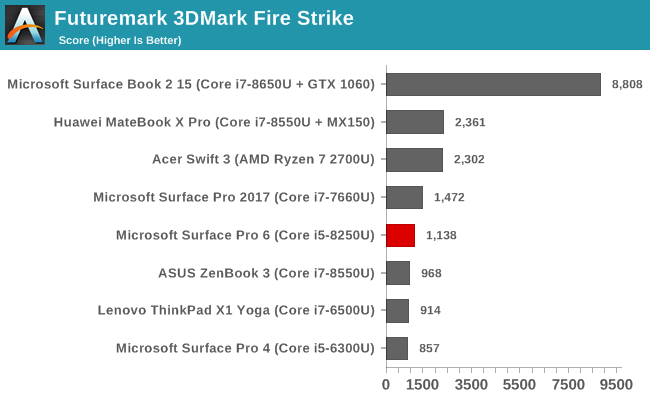 You can see quite easily how the game ends up CPU bound though if you look at the Surface Book 2 which features an NVIDIA GTX 1060 GPU. 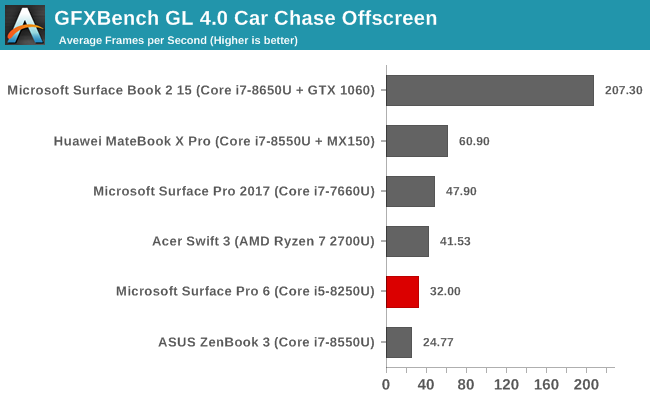 This GPU will easily run circles around anything else in the charts, but the game is held back by the U series processor. Intel hasn’t made significant changes to its GPU lineup for some time, and definitely lags behind AMD’s Vega architecture found in the Ryzen mobile lineup. Due to the lack of availability, Microsoft was unable to maintain the tradition of offering the Iris GPU either. 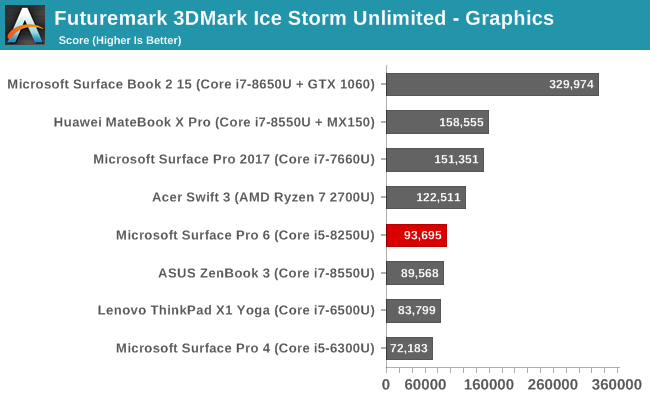 We’re fairly accustomed to where the Intel iGPU sits and until a new one is launched, we aren’t going to see anything too dramatic in the GPU performance. As with last year’s model, the Surface Pro 6 uses a BGA SSD meaning it’s soldered directly onto the motherboard. This saves space, as well as a couple of grams of weight, compared to the M.2 versions. SSDs have become a commodity, so generally manufacturers tend to buy from several suppliers. We can’t say for sure whether Microsoft is doing that this time, since we just have the single sample, but in the past they have so it would not be surprising to see this multi-sourced. In the review unit we have the SK Hynix BC501 in a 256 GB configuration. This is a PCIe Gen 3 x2 SSD, which SK Hynix rates for 110K IOPS random read and 150K IOPS random write. The SSD is bumping into the limits of PCIe 3.0 x2 on sequential read and write, and only the 128 GB model won’t do that according to SK Hynix. 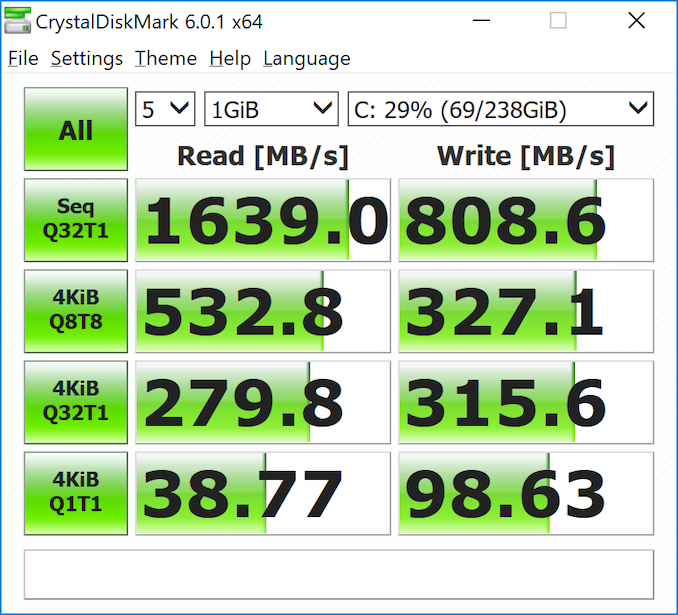 As usual, larger SSDs offer better performance, but you’re not going to see higher sequential reads than this BGA SSD offers in a x2 configuration.